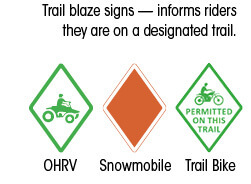 You can ride on trails that are clearly signed and designated for the type of vehicle that you are operating, or on land where you have received written landowner permission to ride. Contact the N.H. Bureau of Trails or a local club for more information. See maps on pages 12 and 13. When purchasing or renting an OHRV or snowmobile, all riders are required to be familiar with the rules and regulations as they pertain to operation, prior to sale or rental. Unless you are on an approved trail system or you have obtained permission for the specific piece of land, you are in violation of the law. All land, whether public or private, requires landowner permission. Over 80% of the snowmobile and other trail systems in N.H. are on private property. To ensure that the trails remain open for future riders, respect the wishes of landowners and stay on designated trails. You may only operate on approved trails for the type of machine you are operating OR you must have written landowner permission on your person. Landowners are not required to post their property against snowmobile or OHRV use. The absence of signs prohibiting snowmobiles or OHRVs does not imply that they are welcome or allowed. Landowners are not responsible for keeping their land safe for use by others who may hunt, fish, trap, camp, hike, sightsee or operate snowmobiles or OHRVs. For more information on landowner liability, go to: wildnh.com/landshare/landowner-liability.html.